NASHVILLE, TN — Valentine’s Day 2018 is just around the corner and up the road. 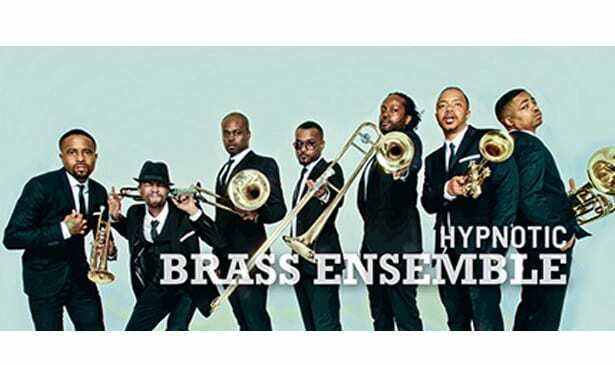 Love will be in there air and everywhere when the internationally acclaimed Hypnotic Brass Ensemble (HBE) bring their signature hip-hop jazz sound to Nashville on Feb. 14, 2018. Tennessee Performing Arts Center’s James K. Polk Theater. HBE, which is comprised of the seven sons of famed Jazz trumpeter and band leader Phil Cohran (Earth, Wind, and Fire, Chaka Khan) who have developed their own musical blend of hip hop, soul and funk, salsa, was just featured on Snoop Dogg’s new song, “Motivation” that was released about a week ago. While growing up on the south side of Chicago, these young men were raised in a household that was continually surrounded around music, and through their father played regularly as the Phil Cohran Youth Ensemble, playing for likes of Nelson Mandela and other notable figures. Once they entered high school, they stopped their study of music for other pursuits. In 1999, after enduring the passing of several close friends and family members, they picked back up with their music, formed HBE, and refined their sound in the subways of NYC and Chicago until recording their first project in 2004. Hypnotic Brass has toured throughout Europe, Asia, Australia, Africa and South America playing with everyone from Prince, Mos Def, Mick Jones (The Clash) and Damon Albarn (Blur, Gorillaz). They’ve performed at Coachella, WOMAD AU, Jazz at Lincoln Center, The Sydney Opera House and Carnegie Hall. The documentary film “Brothers Hypnotic,” explores their music, work ethic, life and experience of being raised by their jazz legend father Phil Cohran. After screening in major cities and festivals, it aired on PBS. Their song, “War” was featured in the blockbuster hit movie, Hunger Games. Now celebrating 10 years of touring internationally as independent artists, the band quietly released “Sound, Rhythm and Form” in 2016 as a special treat for their loyal fans. Hypnotic Brass Ensemble continues to create and record and are currently working on the forthcoming “Bad Boys of Jazz” LP. HBE member Gabriel Hubert spoke to the Tribune last week during a break in the tour, about the music of he and his merry band of six brothers, and about what Nashville can expect when HBE comes to TPAC. TRIBUNE: Since you gentlemen are so well-traveled. Have you ever received email or social media mail, from fans in very remote parts of the world that you would have never thought of? GABRIEL H: Oh yeah. I mean it’s beautiful so far – we don’t get the crazy comments or things, but we once performed in New Zealand in the Taranaki Mountains, and to see how they treated the music and they were so happy to see young black males doing something positive in music was just thrilling. Or to perform at an island call La Reunion, which is on the East Coast of Madagascar, the fans were just awesome. Or our first time playing in Moscow, this lady came to our concert and showed us our name tattooed on her arm. That was her tattoo! It was super dope. Those types of things are amazing for a person like me, coming from the south side of Chicago. I never thought I would travel the world, performing music and making people happy. TRIBUNE: I understand that you guys performed with Prince. GABRIEL H: Yes, we did two shows with Prince. The first one was in Ireland – it was his last show in Ireland and we were the supporting act. The second time was, after that show, the next week we were supposed to be headlining a festival in the UK, but Prince asked us to come to his New Power Generation Festival in Copenhagen to perform. It was great. Chaka Khan, Janelle Monae and so many more were also performing. And that’s detailed in our movie…In between that time, we were also recording in Ireland. What a lot of people don’t know is that the last place Michael Jackson recorded was in Ireland, at this place called Grouse Lodge. We happened to be recording at Grouse Lodge at that time. I slept in the same bedroom where Michael stayed. I didn’t know that I picked the room. I just randomly selected a room. Two people we would love to have collaborated with or been in conversations with is the King of Pop music and the Prince. But to have the type of synergy or energy, is the way the Most High works to put us in that situation was truly an amazing experience. TRIBUNE: We know you’re going to bring some great music when you come to Nashville but what else can fans expect? Do they need to get up and dance around, get caught up in the music or what? GABRIEL H: The thing about music is, it’s different every day. You could play the same song a million times and feel it and hear it different every time you feel it and hear it. We never inhibit people from enjoying themselves. We have a couple of songs where we tell the teachers to just have fun and relax for this song, because the kids have to also be able to lose their minds to this song too. We want to create the atmosphere for people to enjoy themselves and remember us after we leave Nashville.